I'm getting a lot of email asking when a 5D replacement will be available, so I'm guessing many more of you are wondering as well. Unfortunately, the answer is - I don't know. I avoid posting unsubstantiated rumors here - and I have heard a lot of these regarding the 5D replacement. I think most are complete guesses (though some are realistic-sounding guesses). Canon is very good at keeping new product information confidential until (or close to) their formal announcements. The next time Canon historically announces new products is in August. I expected a 5D replacement to be on the list in January, but obviously it was not there. So, August is my next best guess for the announcement of a 5D replacement with availability in 1-3 months (another guess) for those pre-ordering immediately (demand is going to be very high) after the announcement. Keep an eye on this page - I'll immediately post any Canon-related information I get. All that said, the 5D is still an excellent body at an excellent price - I expect a replacement to cost considerably more than the current 5D price (I'm still guessing of course). Canon has released Canon EOS-1D Mark III firmware v1.2.3 and Canon EOS-1Ds Mark III firmware v1.1.2. "This firmware update (Version 1.2.3) incorporates the following improvements. 1. Includes the following new features that were frequently requested by customers to the new firmware. [1D Mark III only] With the camera’s External Speedlite control menu, Flash function settings can be used to set the Wireless setting and Zoom. 2. Improves the stability of AF accuracy in AI servo AF when shooting extremely low-contrast subjects." Canon USA is issuing a lens and accessory price increase effective May 1st. Rumors of this increase have been confirmed in a letter obtained by Rob Galbraith which states that the dealer cost will increase 3-5% on these items. How this increase affects the retail price of these items remains to be seen, but I expect prices to increase. Our friends in Canada are going to see a similar increase on May 5th. So, do you buy your lens or accessory before the price increase, or do you wait to see if Canon announces a rebate program for the Spring? That is a tough question. If the item you want typically has a rebate, it could be better to wait. If your item is not usually on the rebate list, it is probably going to be more cost effective to buy now. You can download previous Canon rebates here. Once again, HP Home has a $200 instant rebate on the HP Photosmart 8750 Professional Photo Printer. Click on the "Save up to 44%" banner and navigate to this printer which is now only $299 (regularly $499). I have added a high ISO noise comparison section to the end of the not-completed Canon EOS Rebel XSi/450D Review. Shown is the high ISO noise performance of 4 EOS SLR camera bodies and the PowerShot G9 in a mouse-over comparison. 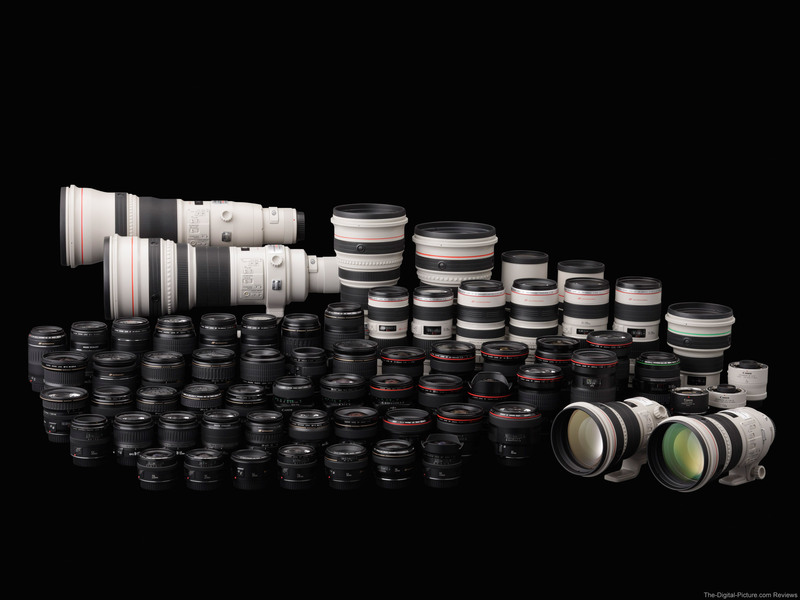 And they have provided a drool-inducing high resolution image of their 2008 EF Lens Collection to go with the press release. TOKYO, April 23, 2008 — Canon Inc. today announced the achievement of a new lens-production milestone as production of the company's EF lenses passed the 40-million mark. Production of interchangeable EF lenses for Canon EOS-series AF (autofocus) single-lens reflex cameras began in 1987 at the company's Utsunomiya Plant. Canon commemorated the production of its 10 millionth EF lens in August 1995, its 20 millionth in February 2001, its 30 millionth in January 2006 and, a mere two years and three months later, has now surpassed the 40-million-unit mark. This achievement reflects users' high level of satisfaction with the innovative technology and quality offered by EF lenses, as well as with Canon's marketing operations and service. Canon's proprietary EF lens, born in March 1987 along with the EOS SLR camera system, marked a new direction in the future of AF systems and soon garnered attention for its use of a large-diameter fully electronic lens mount and an internal autofocus motor. In November of the same year, Canon introduced the industry's first*1 Ultrasonic Motor-powered lens: the EF300mm f/2.8L USM. In September 1989, the EF50mm f/1.0L USM, featuring the world's largest aperture*1 of f/1.0, was launched, and in September 1995 the EF75-300mm f/4-5.6 IS USM, equipped with the world's first*1 Image Stabilizer to compensate for the effects of camera shake, made its debut. Further, in December 2001, Canon introduced the world's first super telephoto lens to employ a diffractive optical element for camera lenses*1: the EF400mm f/4 DO IS USM. Canon's EF lens lineup, through the incorporation of innovative technologies, has consistently led the industry. In conjunction with the launch in September 2003 of the highly acclaimed EOS Digital Rebel/EOS 300D SLR camera, Canon expanded its EF lens lineup with the introduction of the EF-S series of lenses, optimized for use with digital SLR cameras that incorporate APS-C size image sensors. Canon's current EF lens lineup comprises more than 60(*2) models, the most extensive selection(*3) in the industry. The company's diverse range of EF lenses include standard and super-telephoto zoom lenses, Image Stabilizer-equipped lenses, large-aperture lenses, macro lenses, and TS-E lenses, which include a special tilt-shift mechanism that permits the manipulation of image perspective and distortion. The comprehensive product lineup effectively caters to the wide-ranging needs of a broad user base, from novice photo enthusiasts to advanced amateur and professional photographers. This spring, Canon will be adding two new high-performance L-series telephoto lenses to its lineup: the large-aperture EF200mm f/2L IS USM, and the super-telephoto model EF800 f/5.6L IS USM, the world's longest focal length lens(*3) to feature an Image Stabilizer system. *1 Among interchangeable lenses for SLR cameras. *2 Including EF-S lenses and EF lens extenders. *3 As of April 16, 2008. Click on the following image for a full resolution version. Amstelveen, The Netherlands, 23 April 2008: Canon today celebrates a new milestone in the history of D-SLR photography, as production of the company’s EF lenses – which began in 1987 with the birth of Canon’s EOS system – reaches 40 million. Incredibly, a quarter of these were produced within the last two-and-a-half years. With 67 models, the EF series is the world’s most extensive range of D-SLR lenses. “The production of the 40 millionth EF lens is testament to the soaring popularity of D-SLR photography,” said Mogens Jensen, Head of Canon Consumer Imaging, Europe. “With the increasing number of consumer-orientated D-SLR models on the market – including Canon’s market-leading EOS 400D and the new EOS 450D – D-SLR has moved from the professional domain to become a truly mass interest”. “We are delighted that photographers of all levels continue to rely upon Canon EF lenses, and we remain committed to producing the industry’s most extensive, cutting-edge line-up,” he added. Canon’s comprehensive range of EF lenses benefits from a long lineage of forward-thinking design. In 1987, the first EF lenses rewrote the SLR rulebook with their large-diameter, fully electronic lens mount, and the incorporation of a drive motor within the lens. Since then, innovations have included the first lens with an Ultrasonic Motor, the EF 300mm f/2.8L USM (1987), the world’s fastest aperture interchangeable lens, the EF 50mm f/1.0L USM(1989), and the world’s first lens with Image Stabilizer to compensate camera shake, the EF 75-300mm f/4-5.6 IS USM (1995). 2008 will see the addition of two new models to the EF range: the EF 800mm f/5.6L IS USM, the world’s longest image-stabilised telephoto lens, and the EF 200mm f/2L IS USM, another large-diameter telephoto lens. They join a total of 67 different lenses – ranging from super wide-angle to super telephoto models - which includes standard zoom and telephoto zoom lenses, fast aperture lenses, macro lenses, and "the TS-E lens", equipped with tilt and shift function. The production date of the 40,000,000th EF lens is just over two years since the 30,000,000th EF Lens was manufactured and just over 1 year since the 30,000,000th EOS camera body was produced. The Adorama "Refurbished By Canon" inventory has been refreshed. Lots of great cameras, lenses and flashes are available. You should expect like-new gear at nicely reduced prices. ISO 12233 Resolution Chart sample crops and sound clips have been added to the Canon EOS Rebel XSi/450D Review. Comparisons to many of Canon's other bodies are available. First is the Canon PIXMA® MP970, Pro9000, or Pro9500 Photo Printer and Canon EOS-1D Mark III, EOS 1Ds Mark III, EOS 40D, or EOS 5D Digital SLR Camera $200 Mail-In Rebate. And second is the Canon PIXMA® MP970 Photo Printer $100 Mail-In Rebate. As with the 5D + printer rebates in the fall, these appear to be stackable rebates - the printer-only rebate requests the secondary UPC code. Basically, you get paid to buy the printer - which enterprising buyers can then sell on EBay for somewhere in the $200 range. These rebates are not showing on Canon USA's web site. Use the Canon Digital SLR Reviews page to select your camera and navigate to your favorite retailer's web site to get the details - the rebate forms are specific to the larger retailers. Here is the link to the 40D at B&H. The Canon EOS Rebel XSi/450D DSLR is now shipping in the USA. B&H (sold out), 17th Street and J&R have them in stock. Another round of SanDisk Rebates have been released. Once again, multiple purchases can increase the per-item rebate amounts - which are very nice to begin with. This is a 2.3 MB PDF file. Try B&H and Adorama for the best deals. Canon EOS 40D Firmware v1.0.8 is now available. "This firmware update (Version 1.0.8) incorporates the following improvements and fixes. 1. Fixes a phenomenon in which Image Stabilization operation emits a sound when certain buttons are pressed, with the EF-S 55-250mm f/4-5.6 IS lens attached to the camera. 2. Fixes a phenomenon in which the Image Stabilization operation emits a sound from the lens when IS lenses are attached to the camera. 3. Fixes a phenomenon in which a part of the image looks unnatural when reviewed on the LCD. 4. Corrects errors in the Spanish and Norwegian menu screens." Need a good printer? HP Home has a $200 instant rebate on the HP Photosmart 8750 Professional Photo Printer through 4/12/2008. Looks like an excellent deal to me. Chuck Westfall's April Tech Tips are online at DigitalJournalist.org. The Canon EOS Rebel XSi 450D Digital SLR Camera Owners Manual is now available for download (13.6 MB PDF File).